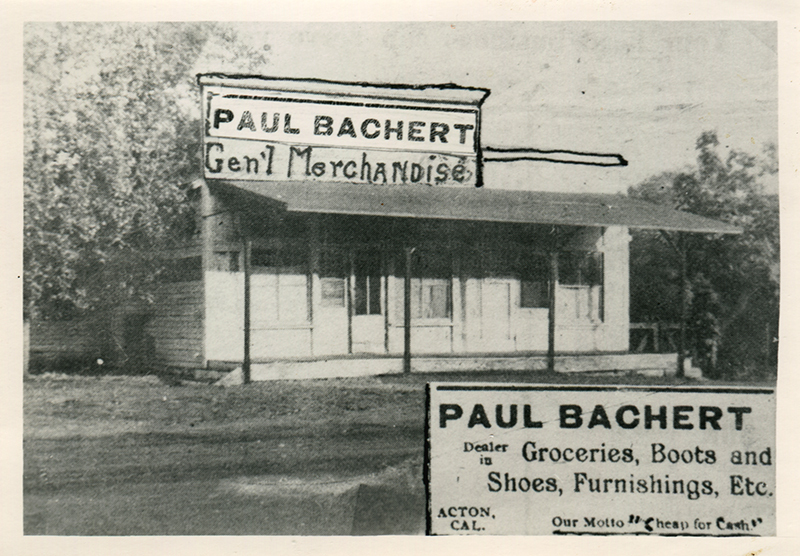 SCVHistory.com SB1801 | Acton | Business Card of Paul Bachert, Discount General Merchant, 1894-1903. Paul Bachert's business card. Bachert was what you might call a "discount" general merchant who built his store in 1894 on 4th Street, now called Crown Valley Road, across the street from the Acton Hotel. Acton historian Bob Buechner says (2014): "This store was located were the present-day Ace hardware is now (31814 Crown Valley Road). It was owned by the Rock Crusher Company from 1910 to about 1915 when J.J. Haisch took over the lease; he then purchased it in 1920 and ran it until his death in 1934. It was a popular spot for filming silent movies in the mid-1920s and early '30s. The Crown Valley Market was in this spot in 1970s and '80s." Paul Bachert came to Acton for his health in 1894 and immediately set out to prove that sitting around worrying about his health would do nothing to improve his health nor add to his wealth. Working as a team, Mr. and Mrs. Bachert bought the property east, across 4th Street from where R.E. Nickel was building his home on the west side of 4th Street. Mr. B. built a general merchandise store which started dependable service for the people of Acton for the next 40 years. Paul Bachert (for the first 10 years) ran the store with imagination and initiative to meet the needs of the area farmers and town residents. Bachert was a good business man whose slogan "Cheap for Cash" never left him with a debt he could not pay. By 1898 advertisements listed groceries, boots, shoes, furnishings and "full line of lady's and gentlemen's underwear just received at P. Bachert's." 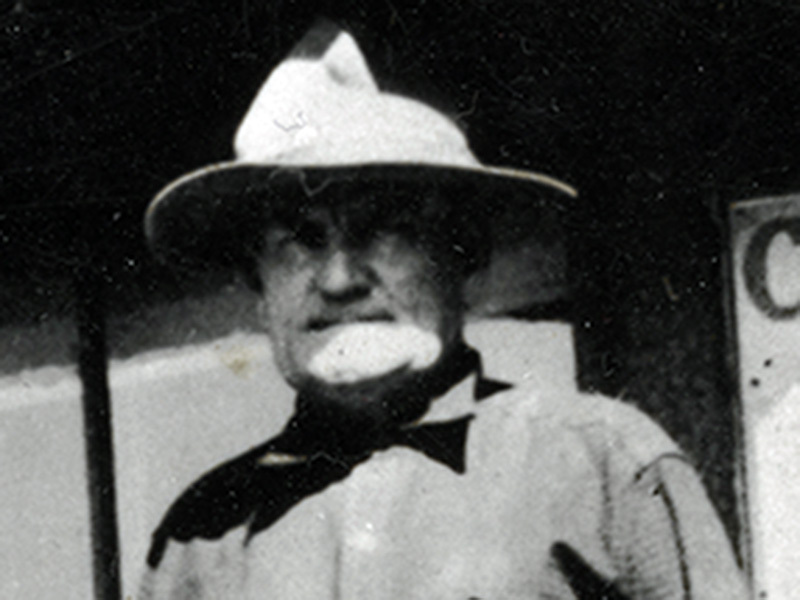 During 1901 Paul Bachert decided he wanted a ranch in addition to his store and bought the Tom Wee Ling place below Ravenna. In June, Paul gave his wife, Selma, a month vacation in Los Angeles and hired Mr. Schreiber to serve as clerk in the store. He took on the agency for selling the Dunham Sewing Machine, became a Notary Public and active in the Cedar Mining District, always variety at the Bachert Store in Acton. This was the year when Paul Bachert began to cater to the needs of those in the bee business. One bee man, B.S.K. Bennett, with headquarters in Los Angeles came to Acton to purchase honey at Bachert's Store. In October 1901 our busy merchant went to Palmdale to purchase 200 cases of comb honey for sale in his store. The next year, R.E. Nickel's brother-in-law, Julius Woock of Elizabeth Lake, brought a ton of fine comb honey to Acton for sale in The Bachert Store. In preparation for an increase in business Paul Bachert hired Zack Davidson and Herman Mellon to build a steel warehouse south of the store as well as work to enlarge the original store building. This took place in 1903 and the S.P. Freight business in Acton really picked up, carloads of bee supplies coming in and carloads of comb honey ready for end of season honey loading day. Bachert bought honey in Antelope Valley in order to fill all customer demands. Carload of wheat for sale and mill feed from Los Angeles — all "Cheap for Cash." Hay — $12 per ton — good quality. In addition to being an "Acton businessman," Paul Bachert was musical, played the zither, played for dancing, was a whizz at Whist, recovered his health and added to his wealth while living and working at Acton. SB1801: 9600 dpi jpeg from original business card purchased 2018 by Sarah Brewer; collection of Sarah Brewer.